In the first installment of his series on music royalties, Dubspot contributor Michael Emenau tackles the big question of how to select a Performance Rights Organization and get paid royalties for your music. Performance Rights Organizations (PROs for short) collect money for the composer(s) and publisher(s) of music which is heard either live or recorded in the public forum. This includes music for television, movies, live performances/concert venues, and other public places (theme parks, shopping malls, restaurants, bars/clubs). The PROs do not collect for Internet royalties (webcasters, internet radio) or mechanical royalties (collected and paid out by the record company). In the USA there are 3 main players, ASCAP “American Society of Composers, Authors and Publishers,” BMI “Broadcast Music Inc” and SESAC “Society of European Stage Authors and Composers.” These main PROs in the US are also affiliated with PROs in all international markets. This means if you have a hit single in Belgrade, the Serbian PRO (SOKOJ), will collect royalties and transfer them to your local PRO for distribution. Once you register a song with one of the PROs, it becomes part of their collection and is available for all of their users. (Users include: TV/cable, film studios, radio stations, concert presenters, bars, restaurants, etc). The PROs calculate a fee for each user, depending on a myriad of factors then deduct their operating fee, around 12%, and send the rest of the money to the songwriters and publishers. Each PRO uses slightly different techniques for tracking all the music that gets played. I’ll be using ASCAP as an example because they seem to be the most open about how their calculations are made. For television and film performances, program producers provide cue sheets (list of the songs and all relevant information such a length, instrumental/vocal, feature/background), as well as program schedules and logs. For radio performances, radio operators report a few times a year their cue list for that day. Concurrently, ASCAP makes a sample survey of all for-profit college and public radio stations. Pattern recognition software is also used to calculate song playlists. For live performances, ASCAP calculates royalties from set lists provided by concert promoters and performing artists. Public spaces, including circuses, theme parks, etc. provide the PROs with their own music use data. Many small businesses, like restaurants and bars, are not surveyed and simply pay a flat rate that is distributed based on trends in local radio stations (based on the type of music). This means anyone performing music outside the mainstream is out of luck. This policy has also been quite controversial as many small/grass roots venues simply can’t afford the rates the PROs are charging. The performing artists at these venues generally are amateurs and aren’t registered with any of the PROs either. The next step involves some rather crazy calculations, and instead of explain it simply (I can’t), I am going to take directly from ASCAP’s site. Keep in mind you have absolutely no control over these calculations so it may be better to put your head down and move on instead of crunching the numbers yourself. Which PRO is best for me? There are a few pros and cons for each which may help you decide. All three seemingly have fairly equal payout structures although ASCAP’s operating cost are a little less which in theory means more money for the artists. Then again, BMI’s larger size may give it more clout in extracting fees. SESAC, because of it’s small size and selective nature claims to have more personal relationships with their members. *Please note all the PROs have windows of time each year to cancel service and for some people this can become a serious issue. All the organizations offer benefits to their members including insurance, conferences and discounted music services. ASCAP has the most conferences, which are apparently quite cool, but are located in mostly major urban areas. To sum it all up, the biggest question is do you want to pay up $50 for ASCAP and know it’s only another $50 for publishing? 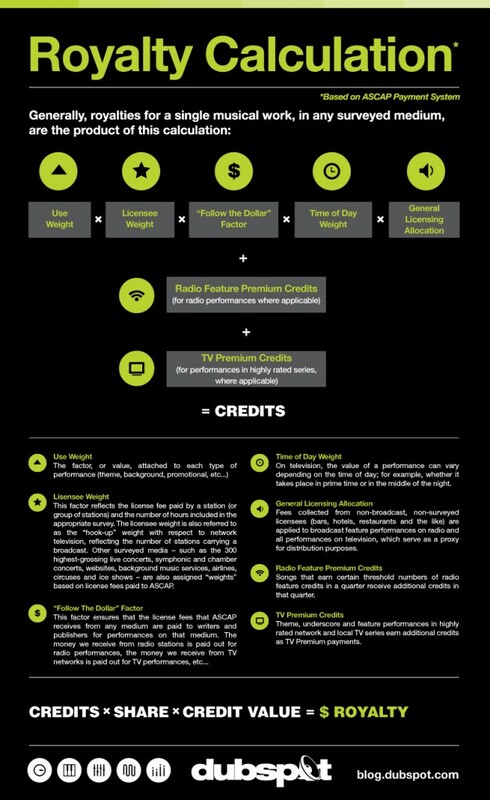 Or start free with BMI and then pay $150 later if you want publishing? If you can get into SESAC, you might as well go for it. One thing to mention is the PROs do not register music for the purpose of copyright protection. To legally copyright a song in the USA you need to go through the Library of Congress by following this link. There are fees attached, so I suggest you gather all your songs and do a group copyright as you pay the same fee no matter how many songs you choose to copyright. Keep in mind, you do not need to copyright your music to receive performance royalties. Overall, the most important thing is that you register your works when they are released or going to be used. Sometimes I receive money from unexpected places, such as having 15 seconds of a song I wrote 9 years ago placed in the background of a TV show. The amount of money certainly varies but it’s out there and you don’t need to do much to receive it. Once you are in the system, you have a chance to collect and you never know who or when someone may choose to use your music.